If you believe in the importance of gardening programs for youth, families, and adults of all ages then you should support the Hazen's Notch Association. Through your financial contributions and volunteer work the HNA can continue to provide gardening programs that support our community. The Hazen's Notch Association's Youth Gardening Program was begun in 1994. Children from northern Vermont communities began participating in gardening programs with the HNA starting with the Native American Garden at Bear Paw Pond. Throughout the 1990's we expanded the gardening program to include perennial flowers and herbs near the Boathouse at Bear Paw Pond, at Little Rock Pond, and at the High Ponds Farm. The children have been planting apple trees for people and wildlife in both the Lower and Upper Orchards at the High Ponds Farm since 2000. In 2001 children planted a blueberry patch in Coyote Meadow. They created raised beds for vegetables and culinary herbs and built compost bins. They also established butterfly gardens at Little Rock Pond and in the High Meadow at the High Ponds Farm. Since 1994 Hazen's Notch Association Youth Gardening Programs have benefited over 3,000 children from nearly 40 communities in northern Vermont. Introduction to Gardening: Children learn through discussion and hands-on activities the basics of preparing, planting and tending a garden that will provide healthy and flavorful vegetables, herbs, and colorful flowers. They learn that the harvest benefits people in the local community as well as wildlife including bees, butterflies and birds. Good dirt: An important place to start is with a careful review of the ingredients of a good soil. Children compare top soil, subsoil , peat moss, fresh compost, sand and clay and learn how a good blend of these can maximize the garden’s success. Working compost bins with new and mature compost stresses the importance of materials over time: days, weeks, months, and even over Winter. Planting Seeds: Using simple tools and their bare hands, children prepare a bed for planting. Learning about the many different sizes and shapes of seeds is fun and informative. Children plant lettuce, radish, spinach, corn, beans and squash. Starting early: Many plants grow well and bloom earlier when transplanted from nursery or greenhouse starts. Children as young as 6 and 7 years old enjoy planting geraniums, lobelias, marigolds and salvias as a way of adding beauty for other visitors to enjoy. Older children enjoy digging larger holes and planting perennial flowers and shrubs, such as daylily, purple coneflower, rudbeckia, high bush cranberry and blueberry. The Three Sisters: Children also learn about the Native American Garden where the Three Sisters – corn, beans and squash – are planted in close proximity for the benefits that each plant provides for the others and for the high nutritional value of these three food staples. The result is a beautiful and complete garden with a variety of color, texture and shape. By learning how these foods were prepared, dried and stored for the long Winter, children appreciate the importance of these three foods to the cultural and dietary health of the earliest settlers of this region. They sample fresh and dried preparations of the three. Link to Summer Camp pages. Please Note: Observe all rules posted at trailhead parking areas. Please do not collect any plant material without permission from conservation area managers. We encourage many species of native plants that are uncommon to rare. Please leave these areas as you find them. Dogs must be on a leash at all times. Thank you. Home to Many Insects: Once a garden has been planned, prepared and planted, it is not long before insects of a wide variety of families arrive. Some, such as bees, serve the very important task of pollinating flowers that will then set fruits. Others serve as natural pest repellants: lacewings, ladybugs, and praying mantids. Another group of insects, the butterflies, are willing visitors to anywhere where there are lots of flowers throughout the growing season for adults to feed from and a lot of vegetative growth for their caterpillars to feed and pupate upon. Life Cycle: By learning about the life cycle and favorite food plants of the butterflies, children ages 8 years and older enjoy planting annual flowers and perennials to increase the diversity of butterflies that are invited to the feast. We learn about the most common butterflies of northern Vermont. Favorite Foods: Each species of butterfly has a favorite caterpillar food plant upon which adults lay their eggs, so the young can begin feeding as soon as they hatch. We'll learn to identify some of the foods that attract our butterflies and also plant them nearby. Gentle Observation: As part of learning about butterflies, we learn a gentle way to capture a butterfly in a soft cotton net. All enjoy a close-up view of these beautiful creatures and then release it to its favorite flower bed. Community Family Gardens: The HNA announces a new program that will bring Gardening Programs to more people in our community. The teaching and display gardens near Little Rock Pond will be expanded so that we can make this attractive area available to parents and their children who may not be enrolled in HNA Summer Camp. Twice monthly programs will be offered for families who enroll as members of the Hazen's Notch Community Family Garden. Instructors will guide children from infant to age 12 and their parents through fun activities designed to instill an enthusiasm for gardening as well as convey knowledge and develop skills. Member families may visit their plots throughout the growing season to tend their plants and enjoy the beauty of this natural area. For more information about Community Gardens in Montgomery visit their website: Montgomery Community Gardens. Bear Paw Pond Conservation Area: A nice combination of plant offerings for butterflies exists at the meadow by the Trails Building at Little Rock Pond with nicely established perennial borders around the edge and some raised vegetable and flower beds in the sunnier middle. In summer a variety of native ferns grow throughout the 2-acre maple glade. The extensive plantings of narcissi in large drifts feature nearly two dozen varieties whose range of bloom times cover almost a month. High Ponds Farm: The High Ponds Farm is the future site of a Community Garden that will bring together people of all ages in Montgomery to provide locally grown, healthy foods. Preparation began in late summer of 2004 and continued through summer of 2005 with tilling, drainage improvements and the addition of compost and organic fertilizers. Work will continue during the spring of 2006 with the hope that this summer will see our first crop of foods from this beautiful area. 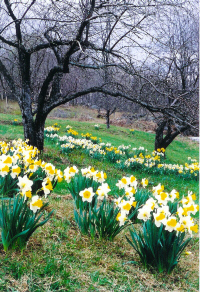 In Spring one can enjoy the narcissi which have been planted under the apple trees in both the Lower and Upper Orchards. Daylillies line the edge of the road across from the site of the Community Garden. The butterfly garden is in the High Meadow near the old cellar hole by the Upper Orchard. Native wildflowers line the Beaver Ponds Trail and the High Meadow Trail from the Visitor's parking area to the High Meadow. There are benches and picnic tables throughout the property. Visitor Information Area locator map, directions, hours, rules for visitors. Hiking Hiking trail map, suggested hikes, weather forecasts. High Ponds Farm General information about the Hazen's Notch Conservation Lands. Calendar of Events A variety of programs are scheduled each year. Montgomery Community Gardens Information about other community garden projects in Montgomery. For more information, see Membership Support. The HNA conducts Summer Ecology and Adventure Camp sessions for children ages 6-14 in July and August. Each summer the Association provides environmental education and outdoor recreation opportunities for approximately 150 campers. Day Camp sessions are for ages 6-11 in 3 age groups and are from 9-5, Monday - Friday. Weeklong Overnight Camp sessions are for ages 10-14 in 2 age groups. The Campership Fund benefits many children in our area who attend the HNA Summer Camp. Please see the Summer Camp Home Page for complete information. Visit Hazen’s Notch in Summer and Fall for Hiking. Approximately 20 miles of the Hazen’s Notch trail network are open for walking and hiking from May 15 through the start of the rifle portion of the deer hunting season, approximately November 15. Many of these trails are located on the 500-acre Hazen‘s Notch Conservation Lands, a private conservation area open to the public. Hike to the summit of Burnt Mountain and enjoy a spectacular panorama from the 2,700’ elevation natural open rock summit. Stop in at the HNA Welcome Center for information, guidebooks and maps. Dogs must be on leash. Mountain bikes are not allowed. Please see the Hiking and Visitor Information pages for complete information. Copyright 2001-2016 Hazen's Notch Association for the Environment, Inc. All Rights Reserved.